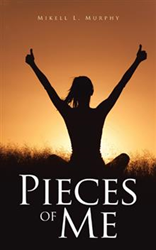 Mikell L. Murphy packs some hilarious memories of her quirky choices and experiences into this little book, “Pieces of Me” (published by AuthorHouse). She loves her family but does not hesitate to spear their faults as well as to spotlight their gifts. Her stories will have readers laughing out loud one minute and quietly contemplating their own memories the next. Murphy shares not only her memories, but also her opinions and beliefs very clearly, almost daring the reader to argue with her. She is a kind and gentle person, but she is also a strong-willed woman who will not be bullied or pushed around by the world or the people in it. Times can be tough, but Murphy seems to handle the rough spots by always looking for a laugh somewhere in the midst of life’s messiness, and these little stories show where she got her grit. Mikell Murphy was born and raised in Texas but moved to Alaska for adventure and higher teacher pay right after college in 1959. She has lived there for more than half a century, but she and her husband, David Comins, currently spend their winters in the Texas Hill Country. She earned her doctorate in education while teaching full-time and raising three children.